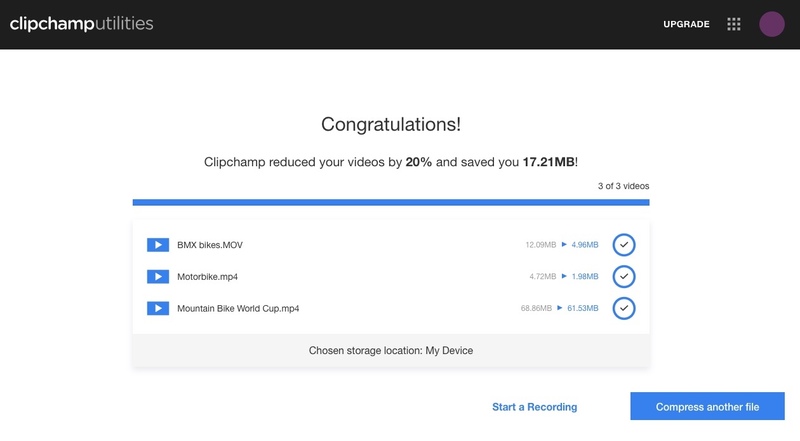 How to convert or compress multiple input video files at once using Clipchamp Utilities in Chrome. You can select several input videos at once in the Utilities dashboard. They will then compress and convert one after the other automatically using the same output settings and save to your computer or upload to your Google Drive (depending on the storage setting you choose), saving you time. IMPORTANT: The batch conversion feature only works in Chrome. You will also have to disable extensions such as Ghostery or Adblock Plus in order for the batch processing to work IF you select Google Drive as the upload destination. NOTE: If you're on the Utilities Free Plan, your batch converted videos will still have a small watermark in the top left corner. To batch convert watermark-free videos you can upgrade to the Business Plan. Alternatively, drag and drop the videos into the Convert my video area and skip to step 3. Choose to store the converted videos either on your Google Drive, or on your Device (your local disk, i.e. your computer). PLEASE NOTE: if you choose Google Drive you will have to disable Ghostery, Adblock Plus and similar extensions in order for the uploads to work correctly. Choose your optimize and customize settings (the format and compression level settings). The options are the same as for converting single videos. These settings will be applied to all of the videos in the batch. Click the Start button in the bottom right. 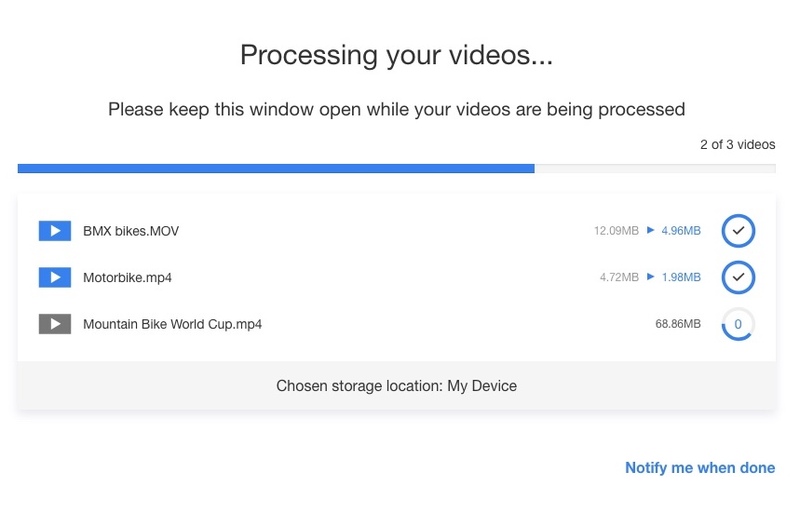 Your videos will get compressed and/or converted one after the other and automatically saved to your chosen location. Your converted and compressed files can now be found in your Downloads Folder (or other location on your computer depending on your browser settings) or your Google Drive, depending on the storage location you chose.